More than 300 UK retailers are no longer selling so-called legal highs, three months after a ban was introduced, the Home Office has said. A further 24 shops have been closed down altogether, while police have also arrested 186 alleged offenders. The Home Office said it was "encouraged" that so many retailers had been "denied the chance to profit from this reckless trade". However, the charity DrugWise said the ban had driven the market underground. 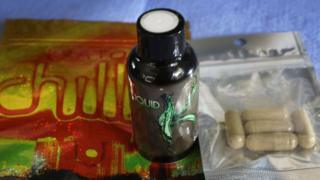 Legal highs became popular on the drug scene around 2008. They contain substances which mimic the effects of illegal drugs such as cocaine, cannabis and ecstasy and go by names such as Spice and Black Mamba. Laws criminalising the production, distribution, sale and supply of the drugs - known as the Psychoactive Substances Act - came into effect at the end of May. Commander Simon Bray, from the National Police Chiefs Council, said London's Metropolitan Police had also seized nearly 14,000 nitrous oxide or laughing gas canisters since the change. Mr Bray said although it was difficult to draw firm conclusions about the impact on use of the drugs, "intuitively I think it must have had an effect". "It will certainly make it less easy for the casual first-time user to get involved in this sort of stuff," he said adding that he believed many people were "lulled into buying these things" thinking they were legal and therefore safe. The Angelus Foundation, which educates people on the risks of legal highs, said it believed many online traders had also shut down. Jeremy Sare, director of communications at the charity, told the BBC: "I think the ban has made a big difference and we are supportive of the legislation. "What we are surprised about is the online supply hasn't surged. Traders seem to have stopped selling. It is still early days and we may look back in 12 months and see more online trading but many look to have closed. "Many were operating within the law but now the law has gone against them so they haven't continued." He said the two biggest groups still using the drugs were homeless people and prisoners. Greg, originally from Essex and now living in west Wales, told BBC Radio 5 live about his experience of a legal high known as Holy Smoke. "I had just a little bit... My head just started spinning and I had this paranoid feeling. I just wanted to go home and hide but I couldn't walk properly. I honestly thought that I was going to die. "From what I've heard it is still pretty regularly available. I think most people still think it's legal." "Alison" a recovering drug user, has also used legal highs. "They've got names like Train Wreck, Black Cobra and Pandora's Box," she said. "It's still really easy to get. You can get three packets for about £25. "No prices have changed. Nothing has changed at all. People are still walking around with it and selling it from home. I don't think it [the ban] has made one bit of difference." However, Harry Shapiro, director of DrugWise, said although the ban may have put off "casual and curious" drug users, it had not deterred those with a serious drug problem and had driven the market underground. "It's moved from the shops to the street," he said. The drugs have been linked to 444 deaths since 2010, including two brothers from Scotland. William McGough, 30, was in the grip of an addiction to the drugs when he drowned in a river in Wick, Scotland, in 2013. Then, in May, the body of his brother Simon, 37, was found next to a packet of the psychoactive substances. Their sister, Melanie Downie, 40, spoke publicly about their deaths to highlight the "addictive and destructive" nature of the drugs. Sarah Newton the government's safeguarding minister, said the drugs "have already cost far too many lives". "I'm encouraged to see that - three months in - police are using their new powers to take dealers off our streets and that so many retailers have been denied the chance to profit from this reckless trade." "These drugs are not legal, they are not safe and we will not allow them to be sold in this country," she added. Video Legal highs: Does banning them work?